Noah Bova feels the bottom layer of his freshly cut hair at Happy Pretty You in Galveston on Friday, March 15, 2019. Bova i student at O’Connell College Preparatory School and looked forward to his classmates’ reactions. Three years ago, when his mother died from leukemia at age 45, Noah Bova started growing out his hair. 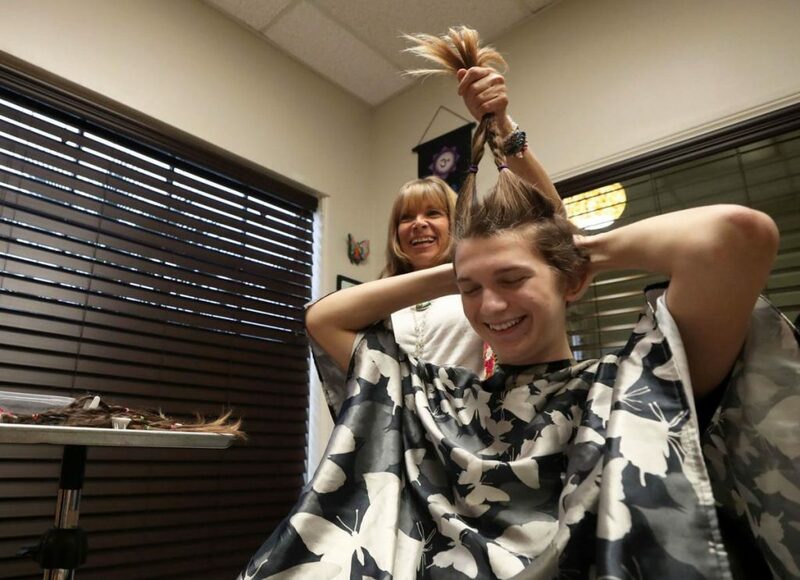 Last week, the O’Connell College Preparatory School junior had his long locks cut off, to be donated to Wigs for Kids, a nonprofit that makes hairpieces for people who’ve lost their hair because of disease, chemotherapy, burns or other conditions. Hair stylist Annie Willow of Happy Pretty You, a salon on 23rd Street in Galveston, volunteers for the Ohio-based organization both by cutting donors’ hair and helping recipients fit and use their new hairpieces. Willow is an ambassador and community education coordinator for Wigs for Kids, a task she said she’d spend every waking hour doing if she didn’t have to make money to pay the rent.